NZPF affiliated societies and clubs – contact details, meeting schedules. In this newsletter you will notice a few innovations. Some brief reports received from some member clubs (from the North to the South!) are set out below under ‘Club News” – I know that the editor would be very pleased to receive more reports from others for future newsletters. I referred to the fact that, as a national body, many of NZPF’s functions and am aware from visiting other philatelic clubs and societies around New Zealand that different things are done in different ways by clubs and societies and it would no doubt be interesting for others to hear what your club or society has been up to or has planned. A report from NZSDA executive officer, Earle Howe, is included. It is inarguable that dealers form a vital part of our hobby and certainly provide a great deal of support to organised philately. Although the nature of things – philately is a hobby for us and a business for dealers/auction houses – means that some collectors can view the dealer/collector relationship as a ‘them and us’ scenario, in my opinion this is the wrong way of looking at it and ignores the reality. We are all in this together. There are a number of things that many dealers do (often quietly and usually going unnoticed by others) to promote philately and stamp collecting. NZPF most definitely appreciates the dealers’ support for our hobby. Also included is an interesting contribution from another valued supporter of the hobby, NZ Post, as to what goes into a stamp design. Over the years NZ Post has produced many excellent stamp designs and below three of the NZ Post design team provide an insight into their roles. Stamps have frequently been referred to as ‘art in miniature’ and whilst I don’t pretend to have any skills as an art critic, and beauty is always in the eye of the beholder, I reckon that NZ Post’s designs in recent years have included some pretty stunning stamp issues. I hope you enjoy this edition of the newsletter. I can be contacted by email anytime – markbenvie@internet.co.nz. It’s that time again – the time for you to consider nominations of individuals who have made significant contributions to our hobby and could be recognised with a Federation Award. The rules for each award can be found at philatelic-awards and in a document held by your society. Nominations can be made on-line by the society president or secretary at the above link or on one of the paper forms available to your society. If you need a replacement form or forms contact the secretary of Federation at secretary@nzpf.org.nz or NZPF, PO Box 58139, Whitby, Porirua 5245. 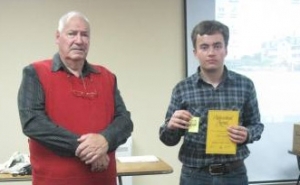 Christchurch youth exhibitor Warrick Wright had an excellent year in philately during 2014. In August his three-frame exhibit Revenue Gathering Stamps of New Zealand was displayed at Philakorea where it received a large vermeil plus special prize. The same exhibit was part of the South Island Australasian Challenge team at Baypex and received another large vermeil plus the youth grand award. In December Jeff Long took the exhibit to Malaysia where it was awarded a large vermeil and special prize. In October Warrick entered a three-frame exhibit on The Revenues of New Zealand Air Travel at Stampex in Adelaide. This exhibit received a gold award, special prize and felicitations of the jury. Warrick with his PYC Gold Achievement Award presented by Geoff Tyson, PYC Vice-Chairperson. Warrick is a member of the Christchurch Youth Stamp Club and at the end of the year they held their Christmas party where they presented the annual club cups. This year Warrick received three of the five cups that were presented. In addition to receiving the club cups Warrick was also presented with his PYC Gold Achievement Award. There is a lot of work involved to achieve a Gold award and since the awards scheme began in the mid-1980s only 12 have been presented. Our congratulations go to Warrick for his excellent achievements and we look forward to seeing what 2015 has in store for him. The NZ Postcard Society is hosting weekend sessions in Christchurch on May 9/10 and Paraparaumu on May 16/17. The cost for attending a weekend session is $40, which covers the venue hire, materials, morning and afternoon teas and lunch on the two days. The sessions are aimed at anyone interested in writing up their postcards, perhaps preparing an exhibit, and also covering what postcard judges look for in an exhibit. Particular sections will cover: what is a postcard, researching postcards, presentation techniques, use of varying page sizes, rarity and difficulty of acquisition, exhibiting regulations and guidelines, and judging postcard exhibits. Those attending will have plenty of opportunity to bring up their own questions, and also to request any particular additional sessions. Further details can be found at Postcard Society seminars 2015/ or by emailing Jeff Long at jefflong@xtra.co.nz or writing to him at 160 Soleares Ave, Mt Pleasant, Christchurch 8081. The Association of New Zealand Philatelic Judges is planning to hold one day seminars in Auckland and Wellington on 4 July and 26 July respectively. These seminars are part of a regular programme and are seen as an essential means by which judges can maintain their skills and knowledge. Exhibitors, who wish to understand more of the judging process, may also be welcome. 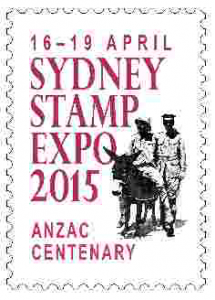 The Auckland Philatelic Society runs an annual exhibition and, in 2015, NIPEX will be run concurrently on 6-7 June 2015 at the Mt Eden War Memorial Hall, 487 Dominion Road, Auckland. NIPEX, which has evolved from the Northpex exhibitions most recently held in 2014 and hosted by the Whangarei Philatelic Society, is a competitive exhibition for all North Island philatelic clubs and societies. Entries can be 8- or 16-pages in a full range of classes. Entry forms along with entries must be Auckland Philatelic Society by 27 May 2015. The theme for this year will be Gallipoli. Ten dealers are expected to be present and the society is looking at ways to make the Sunday even more attractive for everyone. Details about the classes, rules and an entry form can be found at NIPEX 2015. On 28 March the Manawatu Philatelic Society hosted its 54th Annual Convention. Invited dealers as well as society sales tables had a steady interest in the material on offer. Displays from the Upper Hutt Stamp Club and Hutt Valley Philatelic Society were supported by two talks from a member of each club. Later in the day a meeting of societies, where nearly all of the Central Region societies were represented, included a good discussion about ways to make the Convention more attractive to collectors and the general public. The Manawatu Philatelic Society should be able to take heart from the positive contributions made during the meeting. This was followed by a discussion led by Central Region delegates to Federation relating to the management of the frames held by the region. The former ‘free’ storage they previously enjoyed is no longer available and investigations are being undertaken to find a suitable but inexpensive location and method of storing the frames. The NZ Stamp Collectors Club (NZSCC) of Christchurch, as the winner of the 2014 event is hosting it again in 2015. Details of this year’s competition have been forwarded to all societies. Each society entry must be of five frames of 16 standard pages and at least four classes per entry. There can be no more than two frame per person and no more than two frames per class per entry. Entry forms, copies of the title pages (can be in draft form) for each exhibit along with the entry fee of $50 must be in the hands of NZSCC by 11 July 2015. The posted, couriered or delivered by hand exhibits must be received by NZSCC by 1 August 2015. The entries will be judged using NZPF one-frame guidelines and will be on display at the Philatelic Centre, Riccarton, Christchurch on Saturday 8 August 2015. 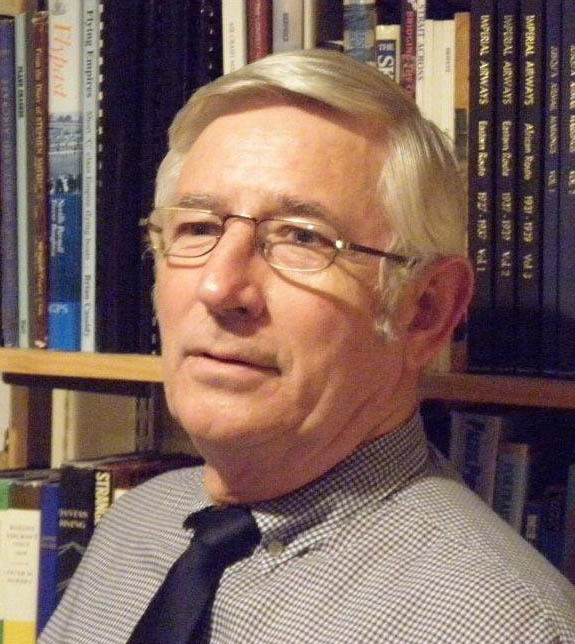 The monthly newsletter of this society is now to be edited by Graham Gould as Noel Ross is retiring from the job after over 30 years in the job.Congratulations Noel on a long and, we are positive, valued contribution! George Stewart of the Southland Philatelic Society ran an introductory workshop to exhibiting in March and was pleased to have ten members participate. • an exhibit extends the breadth and depth of a basic collection of stamps as you discover more items that better tells the story being told. George also believes that visiting an exhibition opens up a whole new philatelic world. As examples the workshop was shown a traditional and an open class exhibit. Even though these two classes are quite different they, and indeed all exhibiting classes, need a story line with a good beginning and good ending with the story in between broken into logical chapters or sections. A title page, which includes the plan of the exhibit, is essential. George spoke on methods of mounting a range of items, discussed paper size and weight and gave a brief introduction into the write-up. It is planned to run some more exhibiting workshops, with those attending invited to bring along material suitable for an exhibit. The Regional Stamp Show is based around the NZ Stamp Dealers Association’s (NZSDA) Wellington stamp show. A partnership of the four Wellington societies – Kapiti, Hutt Valley, Upper Hutt and Wellington – with support from Royal work closely with the NZSDA to run this annual event to be held this year 2-3 May 2015. The four Wellington Societies compete for the Neville Harris Memorial Trophy in a one-frame competition. The standard over the last years has been very high and the competition, while not fierce (it seems inappropriate to use that word in relation to philatelic competition), has been very close. These competition frames are supported with around 80 frames of material often merely taken from society member collections. The intent is to show people the wide range of interests of the society members and the varied ways people mount their material. We start with an idea, usually relating to a significant event, anniversary or subject. This idea can come from within the team, from collectors or from any interested party. We then consider how the idea fits with our upcoming stamp calendar, as some stamp issues are decided well in advance. As a team, we take the idea and flesh it out into a concept for a stamp issue; for example, what is the wider story we’re trying to tell and will it contain any special technology or techniques to reflect the subject matter. We then decide to either hand this concept to one of our in-house designers or request design concepts from external design agencies. If we’re happy with one of the concepts, we’ll develop it to finished artwork. The final artwork is normally between 400% – 600% larger than the finished stamp size to ensure precise detail in the printing stage. We’ll also consult with subject matter experts and key stakeholders to ensure the content and story of the stamps is accurate before printing. From here we create relevant marketing materials to promote the issue (mailings, brochures, posters etc.) prior to the issue day. We asked our in-house design team what they enjoyed most about designing stamps. I enjoy that we have input in and get to see the entire project from start to finish. From coming up with an idea, researching, designing the stamps and ultimately seeing the finished product. It’s great to see an idea come to life. Stamps and Coins are so left-field, that you can almost pull anything out of the bag and that’s what I love about it. Coming from a research and concept background, with a passion for social design and critical theory my purpose as a designer is to communicate ideas and information and for me stamps are a great channel to do so because there are no real boundaries. We’re always looking into new ideas and ways to incorporate emerging technologies into our products, so there is always an opportunity to learn. What I look forward to about designing a stamp issue is the challenge of creating a dynamic composition, with an interesting backstory behind it on such a small canvas. I am also very excited to see my designs out in the public space as I’ve never created something that has been printed and sold on this kind of scale! If you have any ideas for stamp issues, feel free to email collectables@nzpost.co.nz with your suggestion, or write to the Collectables and Solutions Centre. The New Zealand Stamp Dealers’ Association (NZSDA) is appreciative of the close working relationship with the NZPF, expressed formally in an Agreement, and practically in NZSDA’s significant support for National Exhibitions. This arrangement enables members of NZSDA to have trade stands at National exhibitions. Those members pay fees for the privilege. Those fees enable Exhibition Committees to balance their budget. Without such payments the Exhibitions would probably not take place. NZSDA values also the invitation to contribute regularly to the NZPF Newsletter. Readers will be aware that John Mowbray, an NZSDA member, has recently reached the milestone of 50 years’ experience as a stamp dealer. Over recent months John has written a series of articles in his monthly Auction Catalogue, detailing the development of his business and trading interests. From his teenage years John has seen it all, in the ebbs and flows of the philatelic world. From humble beginnings, John has grown his trading ability and renown in such a way that significant international recognition has come in the form of Board membership of Stanley Gibbons, and a term as President of the International Federation of Stamp Dealers. John has not hesitated to take bold steps, culminating in the listing of Mowbray Collectables on the New Zealand Stock Exchange. That move has not been without its challenges. Further evolution of John’s business interests is currently taking place. The ‘Mowbray story’ is symptomatic of the many changes in philately and stamp dealing in New Zealand over our lifetime. Almost completely gone are the traditional stamp shops. 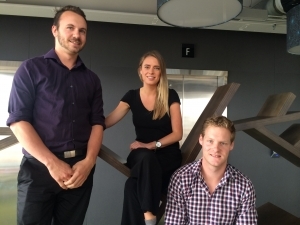 While there are currently several NZSDA members who have worked in the trade since leaving school, there are almost no young people currently employed by other dealers. Daniel Wells, working for his uncle (Chris Wells) at Philatelic Distributors Ltd in New Plymouth, stands out as the only possible future long-term dealer! You will find the more than 50 NZSDA members in a variety of trading situations: at Stamp Shows and Stamp Fairs, at National Exhibitions, at their homes, or in their offices. Increasingly you will find them on the internet, on their own websites, on Trade Me, on Ebay, etc. In fact, some of our current members only trade on the internet! You will find NZSDA members all over the world as well: in the UK, Belgium, China, USA, Australia as well as here in New Zealand. As Executive Officer for NZSDA I receive a continual flow of enquiries from the NZSDA website, asking about valuations and where to contact dealers. Obviously the public values the professional face of NZSDA, and our ethical code. As we say often in our publicity: ‘You can deal with us with confidence’. This ethical and professional face is of crucial importance in stamp trading. There are, and there always has been, many stamp traders who are not members of NZSDA. Most members of NZSDA began in that way! That’s a healthy sign for the great hobby of philately. NZSDA encourages such traders to consider joining our Association, for the benefit of belonging to a professional body. I will welcome all enquiries that come my way! As advised in the last newsletter, Federation has agreed to amend rules to allow for 2-frame exhibits. This change has also seen the rules further amended to allow for Youth in the 19-21 age group (FIP Age class C) to enter a developing exhibit of 2-frames. Federation at its recent meeting (21 March) received a report from the Association of NZ Philatelic Judges. As a consequence the rules for the Modern have been confirmed and can be found on the Federation website at Special regulations-national Modern. The secretary has sent an email message to all exhibitors with an email address on the Federation’s exhibitor database. If you are an exhibitor or have exhibited since 2000 and did not receive this message it means we do not have your email contact details. Please contact secretary@nzpf.org.nz and he will add your details to the database and provide you with a copy of the message sent. We do recognise that some exhibitors do not have access to the internet nor have an email. If you are one of these exhibitors please let us know (send to Secretary, NZ Philatelic Federation, PO Box 58139, Whitby, Porirua 5245), give your postal address and you will be contacted. Jeff Long, New Zealand Commissioner for these two exhibitions held in Kuala Lumpur 1-6 December, advised that the Youth exhibition was the first of its kind since Belgica in 2006. His wife Jenny came along as unofficial assistant commissioner (pretty much essential these days if you are to avoid overweight baggage charges). Jeff carried nine youth exhibits and while he invited entries for the FIAP exhibition he didn’t push it too hard as he knew there would be substantial pressure on these exhibitors in 2015. Bin Room procedures were competent and very smooth, both inwards and out. Jenny and Norman Banfield did much of the organisational work. Jeff and his wife Jenny, along with Glen and Jo Stafford from Mandura in Australia, spent many hours mounting exhibits. Many of the frames were brand new, with a black background, which made the exhibits look really good. At the end of the show, Commissioners were encouraged to take down their own exhibits to save on double checking in the bin room. This is now a common procedure in NZ and Australia, but this is the first time it has been used on a large scale and it worked well. There was a special award for the ‘best’ Commissioner at the exhibition although Jeff didn’t know this until the day of the Palmares. Much to his surprise, it was awarded to Jeff! Jeff felt the results were good. Warrick Wright’s result was excellent and he received a special prize, being placed third in his age group, just behind two Indonesian exhibits, and having the best traditional exhibit in all age groups. A number of seminars were provided and these covered Modern philately, Thematics, Aerophilately and Youth. There were some informal discussions about an adult development class at national level in some countries, and even about picture postcards. Something may be seen in print next year! 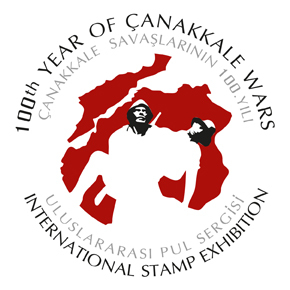 ÇANAKKALE 2015 was an International Stamp Exhibition with the main theme of Çanakkale Wars (Gallipoli Campaign) and WWI. Our sole entrant, Barry Scott, joined with Australian entrants as did our two countries in the Gallipoli Campaign one hundred years ago. Congratulations Barry on your award! As this newsletter is being written our Commissioner to the Sydney Stamp Expo, Lindsay Chitty, is making final arrangements to attend with the 86 frames that have been entered from New Zealand. We wish the entrants the best of luck! The following profiles one more of Federation’s executive. Given a Christmas present by grandparents of a stamp album at age five Barry has been a collector ever since. He collected general issues prior to specialising in collections or exhibits of traditional, postal history aerophilately and postal stationery.He has been active as a committee member in the Auckland region for a number of years in societies such as Postal History Society of NZ, Airmail Society of NZ, Wellesley Philatelic Society and Auckland Philatelic Society and nationally has been council member and Vice-President of the Royal Philatelic Society of NZ. Barry has also served previously as northern district delegate to Federation prior to this new term which started in November 2014. Barry, a Fellow of the Royal Philatelic Society London, is one of their two representatives in New Zealand. Please check the details contained here. If there is something wrong here there is likely to be something wrong on your society’s webpage on www.nzpf.org.nz as well – please check. Auckland Philatelic Society: PO Box 1932, Shortland Street, Auckland 1140; Meeting 1st and 3rd Tues (except Jan). Marlborough Stamp Collectors Club: PO Box 120, Blenheim 7240; Meeting 3rd Mon (except Jan and 2nd Mon Dec). Philatelic Youth Council of NZ: PO Box 2979, Shortland Street, Auckland 1140. Postal History Society of NZ: PO Box 99673, Newmarket, Auckland 1149; Auckland 1st Mon (except Jan & public holidays). Ph: 09 5220311. Chapter meetings held Invercargill, Nelson, New Plymouth and Wellington. South Auckland Philatelic Society: PO Box 23265, Hunters Corner, Auckland 2155; Meeting last Sat (except Dec), Papatoetoe, day time meetings 3rd Fri (except Dec and Jan). Thames Valley Philatelic Society: c/- 123 Brunton Crescent, Thames 3500; Meeting 1st Mon (except Jan). Ph: 07 8687923. Timaru Philatelic Society: PO Box 237, Timaru 7940; Meeting 1st Wed.
Upper Hutt Philatelic Society: PO Box 40480, Upper Hutt 5140; Meeting 3rd Mon (except 2nd Mon Dec).